RAYMONDVILLE — For decades, residents wanted to know why a historical marker did not stand at the side of the Willacy County Courthouse. They won’t ask that question any more. This weekend, County Judge Aurelio Guerra and Commissioners Eliberto Guerra and Oscar DeLuna unveiled the marker declaring the 94-year-old courthouse a historical building. Aurelio Guerra led the drive to request the Texas Historical Commission place the marker at the courthouse, Cruz Tijerina, president of the Willacy County Historical Museum, said yesterday. The process to designate the courthouse a historical building is part of the plan to renovate it nearly three years after widespread mold forced officials to close its doors. Last year, the historical commission gave the county an “emergency” grant of up to $402,970 to try to stop the building’s decay. To use the grant money, the county would have to come up with a matching share of up to $402,970. Now, the county has entered into a contract with an architect to launch the project aimed at stopping the building’s decay, Leah Brown, spokeswoman for the historical commission, said yesterday. Brown said the county is expected to launch the project after the holidays. “I’d love to see our building restored,” Tijerina said. 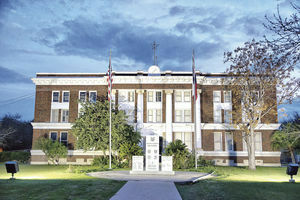 This year, the courthouse was also placed on the list of National Register of Historic Places. Completed in 1923, the Classical Revival style courthouse was designed by San Antonio architect Henry T. Phelps and built by the Walker Construction Co. for $48,322. The courthouse, brick trimmed with cast stone, features a traditional cross-axial plan with three floors and a basement. Through the years, the building’s exterior and interior underwent several changes. Then in 2008, the Texas Department of Health found mold in the courthouse, recommending officials take steps to remove it. By 2010, the county had paid $55,000 to draft a preservation master plan it presented to the historical commission as a prerequisite to a grant application. Past County Judge John F. Gonzales Jr. said his administration worked to apply for a grant to renovate the courthouse but did not go through with an application because the historical commission lacked funding for the project. In February 2015, commissioners closed the three-story courthouse, moving employees into the Administration Building after its $2.1-million renovation. After taking office earlier that year, Aurelio Guerra worked to launch the courthouse’s restoration, estimating the project would cost as much as $8.5 million. Guerra also began the process to designate the courthouse a historical building. Tijerina said he believes Gonzales’ administration may have helped launch the process.